I am asked questions frequently about feline sneezing and I have found that there is often confusion about the cause. Many cat owners are under the assumption that the cause of cat sneezing could be allergies. In reality, cats are very different from people in that regard. Cats generally show their allergies in skin reactions, not respiratory symptoms. Cats who are sneezing almost always have upper respiratory infections, or “feline colds”. These infections are most often caused by feline viruses. In that respect, they are no different than people. Our “colds” are caused by viruses. That is why antibiotics are rarely recommended when you have a cold. Your upper respiratory infection is not generally caused by bacteria, which is what antibiotics kill. In that regard, feline colds are a bit different. While the initial infection is caused by a feline virus, cats are particularly susceptible to developing secondary bacterial infections. Cats with upper respiratory infections often develop a green or yellow or white discharge from their noses. That discharge most often means there is indeed a secondary bacterial infection and antibiotics may be needed. Another major difference between feline colds and our colds is the frequent accompaniment of red, runny eyes with your cat’s cold. This is a very common occurrence and may require antibiotic ointment or drops in your cat’s eyes in addition to an oral antibiotic for the infection in the nose. Your cat’s eyes can become very red and swollen and can even develop ulcers on the cornea. Just as there are many different strains of virus that cause us to develop upper respiratory illness, there are also many different viruses that can affect your cat and cause feline sneezing. Often, however, they are from either the Feline Herpes Virus family or the Feline Calicivirus family. Also known as the Feline Rhinotracheitis Virus, this is the cause of the majority of respiratory infections in cats. It is transmitted from cat to cat through direct contact with saliva and nasal secretions. It can also be passed from a mother cat to her kittens. The virus can live in the environment and on contaminated objects for several hours. Almost all cats have come in contact with the feline herpes virus, but most do not go on to become chronically ill. The infection is most severe in young kittens. It can cause severe nasal congestion and ulceration of the eyes which can lead to vision impairment or even blindness. As it most often interferes with appetite, any cat, but young kittens in particular, is very susceptible to dehydration and severe illness, even death, from lack of nutrition. There is most often a high fever present along with feline sneezing caused by the herpes virus and pneumonia can develop, especially in kittens or immunosuppressed cats. The disease most often begins with sneezing and red eyes, but can quickly worsen and secondary bacterial infections can develop. The eyes, particularly of kittens, can become very ulcerated and infected. Here's How YOU Can Directly Ask Your Questions! Treatment for feline respiratory disease is mainly supportive. Fluids, appetite stimulants, force feeding, and antibiotics are most often needed. Antiviral eye drops should be started early on if the eyes have ulcerations and severe conjunctivitis. I have been able to save the eyesight of many kittens by initiating aggressive antibiotic and antiviral treatment if the kitten is brought to me in time. One of the first concerns clients often have when I tell them their kitten/cat probably has feline herpes is about the possibility of it being contagious to people. The word herpes alarms many people, but fortunately, the herpes virus your cat may have is not contagious to you. It has characteristics of the herpes viruses of humans, including its ability to live in the body indefinitely and become reactivated under periods of stress. However, it is species specific and you are not in danger of catching it from your kitty. Cats that survive early herpes virus infections and are able to keep their eyesight often have blocked tear ducts, resulting in a watery discharge from the eyes for life. Rarely does this cause a problem – once the initial infection has calmed down, most cats never have a serious problem with their eyes again. They may develop conjunctivitis from time to time and need antibiotic ointment in their eyes, but are very unlikely to ever develop corneal ulcers again. Other cats have chronic nasal congestion for life. This, in my experience, rarely shortens the cat’s life span, but can cause noisy breathing, intermittent feline sneezing and also result in flare-ups of increased nasal congestion requiring antibiotics from time to time. Some cats are helped by the daily administration of L-Lysine, an essential amino acid which can inhibit virus replication. This does not cure the feline herpes virus infection, but can, in some cats, decrease the severity of outbreaks of active infection or increase the time between outbreaks. Every cat deserves a trial of L-Lysine for a long enough period of time to see if it makes a difference. Speak to your veterinarian about giving your cat L-Lysine for chronic herpes infection and about the dosage. To learn more about feline herpes, please visit this page. There IS a feline herpes vaccine. When your cat gets the FVRCP vaccine, the standard cat vaccine along with Rabies, he is being vaccinated against Feline Viral Rhinotracheitis Calici Panleukopenia. The vaccine doesn’t prevent infection necessarily, but can make the illness much less severe. Before we had this vaccine, many cats died from feline herpes virus, feline calici virus, and feline panleukopenia. It is very important to have all kittens vaccinated with the initial series as well as any new cats with unknown vaccine history and then to have annual boosters the first year or so depending on the advice of your veterinarian. 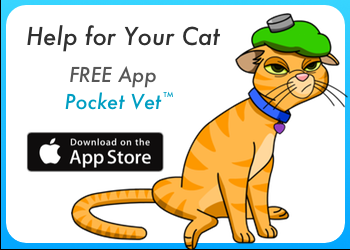 You can also learn more about cat vaccines here. The other feline virus responsible for cat sneezing is the Calicivirus. Symptoms can be very similar, although the feline herpes virus is more likely to cause ulcers on the eye, while the calicivirus causes ulcers on the tongue. The Calicivirus also can cause a transient shifting leg arthritis. If I see a cat that is lame in one leg and then a few days later is lame in a different leg and has some of the other respiratory signs, I am fairly certain it is the Calicivirus that is responsible. While there are some rather sophisticated tests that can distinguish between the two viruses, they are not always accurate. I have most often found that it is really not necessary to know which virus is causing the feline respiratory disease. The treatment is the same - supportive care with fluids and nutrition and antibiotics if necessary until the cat recovers from the virus. After recovering from the brunt of a feline respiratory virus, your cat’s sneezing can continue for some time. As long as it is less frequent and the appetite is good and fever and lethargy and signs of bacterial infection have subsided, this is not of concern and generally tapers off over time. The most important point I want you to take away from this discussion is this: if feline sneezing develops in your kitty or she has red or swollen eyes, it is so important to take your kitten or cat to the veterinarian. These are not signs of an allergy in cats. These are signs of a feline virus and if treated early, the outcome can be very favorable. Left untreated, secondary bacterial infections can set in, corneal ulcers can occur, appetite can be lost and dehydration is very likely. This ends up being far more serious in terms of your cat’s health, you and your cat’s stress, your wallet and it can even result in your kitten or cat losing his vision or even his life.